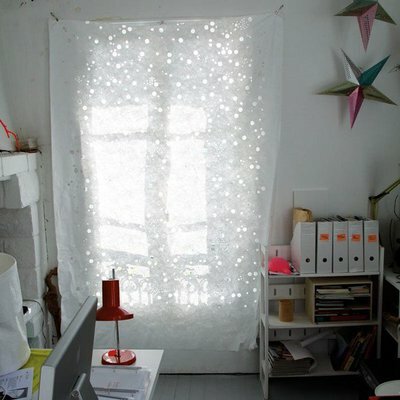 Oo is a curtain that filters and diffuses light magnificently, like a moucharaby for instance. It thus protects from the sun without concealing it completly and protects from outsiders looking in. 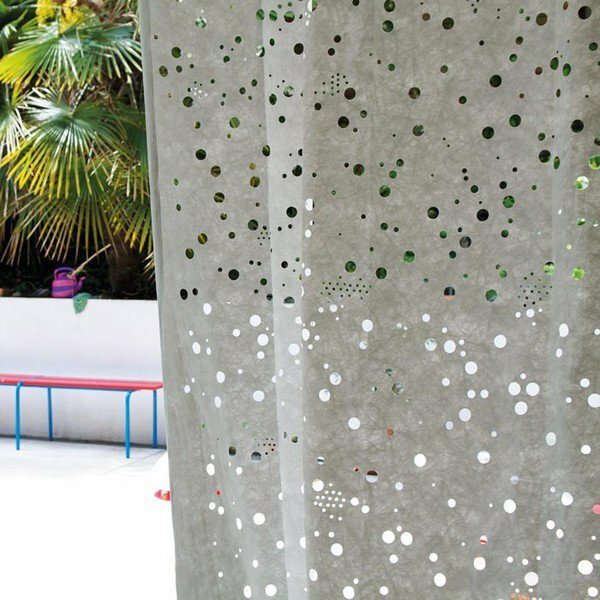 It withstands water so it can be used indoors as well as outdoors, in a lounge, a bedroom, an office, but also as a sunshade on a terrace or as a shower curtain. 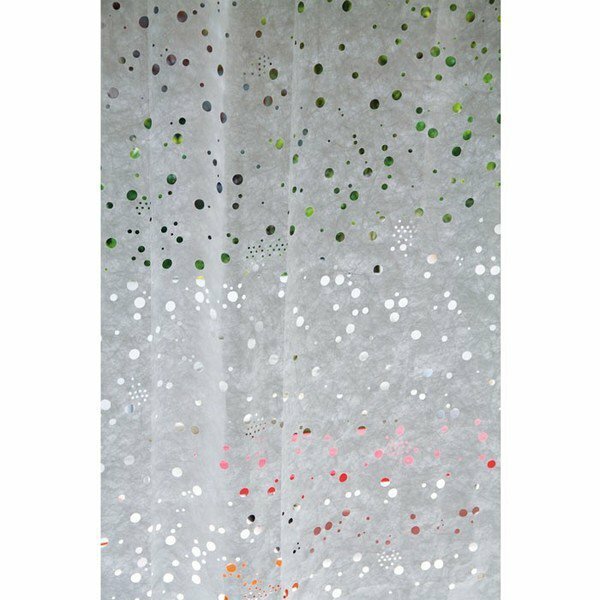 The Oo Tyvek curtain is a non woven panel. It therefore needs no sewing. You can reduce its height by simply cutting the bottom off. 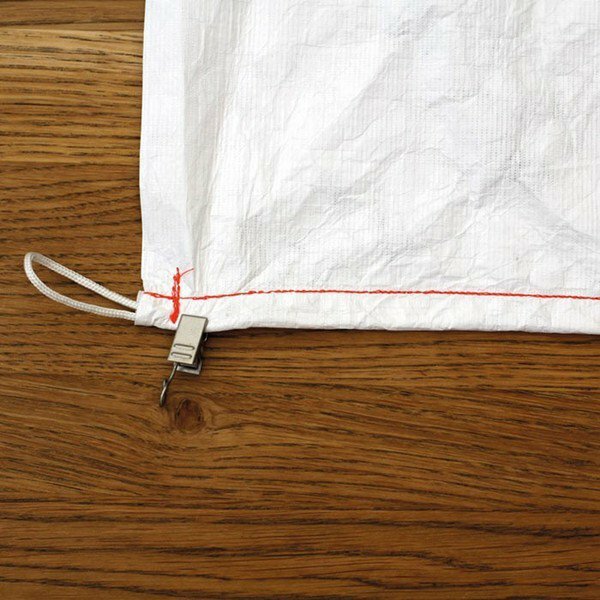 If you wish to reduce its width, you can also do the same but you will cut through the top cord which is optional depending on the use you make of the curtain. Since the Oo Tyvek curtain is very light, you can place two, even three or four panels on a same rail with no reinforcement in the middle (obviously choose a good curtain rail). Your panels move freely from one end of the rail to the other with no difficulty. 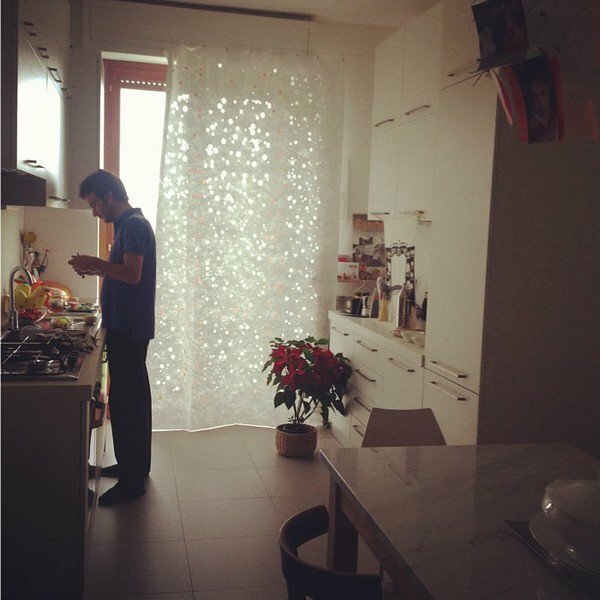 using curtain hooks with clips, available almost everywhere in the shops (see picture on the right). 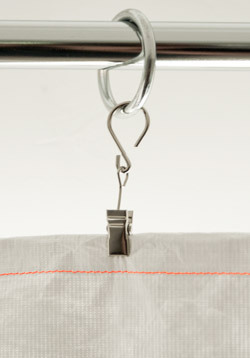 A cord slipped in the cuff at the top of the curtain provides the hooks with a perfect hold. 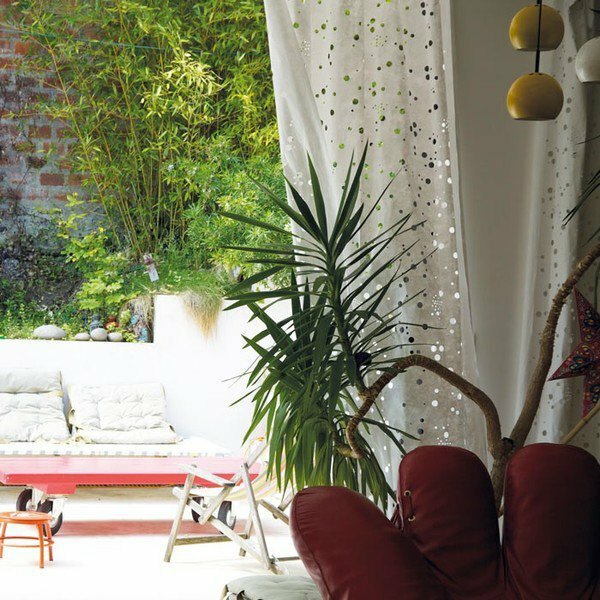 You will then be able to hang your curtain either on a cable or a curtain rail. by hanging your curtain using the cord at the top that goes from one end to the other. Two small hooks in the wall or a doorway and Bob's your uncle. With this technique the width is set (152cm). 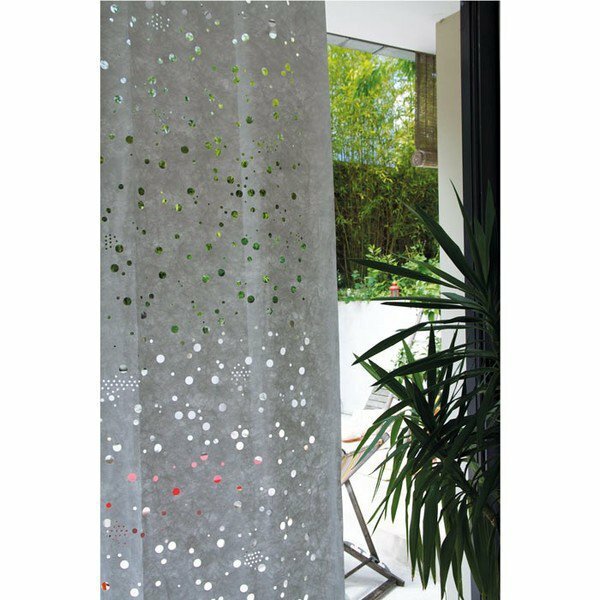 Machine wash: the tyvek® curtain can be cleaned (separately) in the washing machine, delicate cycle without spin-drying. Do not put it in the tumble drier. Do not iron. Do not dry clean. 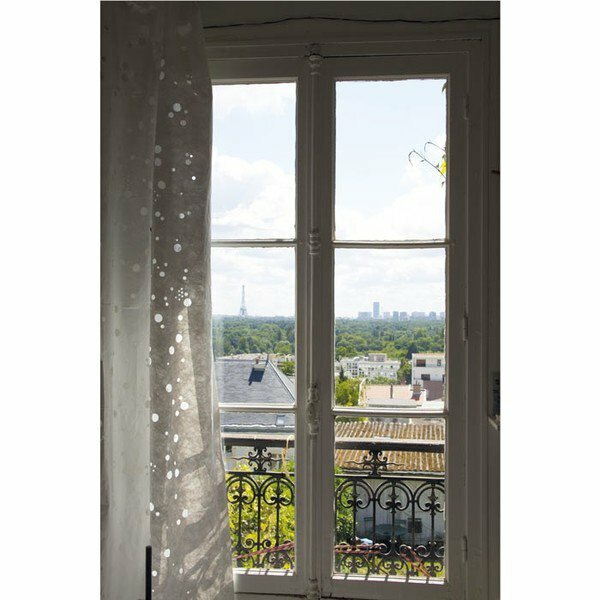 With a sponge: if the curtain does not require a full wash, a sponge and soapy water will do fine for a quick and efficient clean without taking the curtain down. 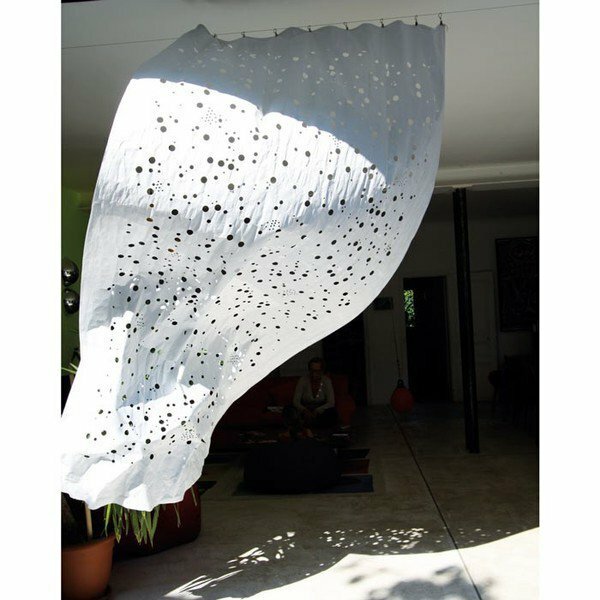 Tyvek is an unusual material that combines great lightness and strength. Touching it feels like a thin layer of wax. 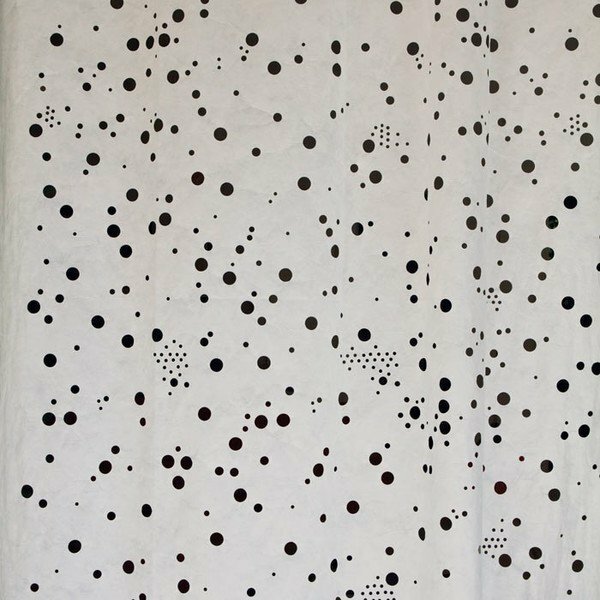 Your tyvek curtain has a distinctive feature: it changes with time. The older it gets the more flexible and smoother its texture becomes. 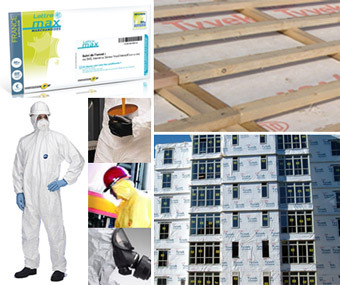 Tyvek® is an exceptional material, invented and patented by the American chemistry giant DuPont in the sixties. 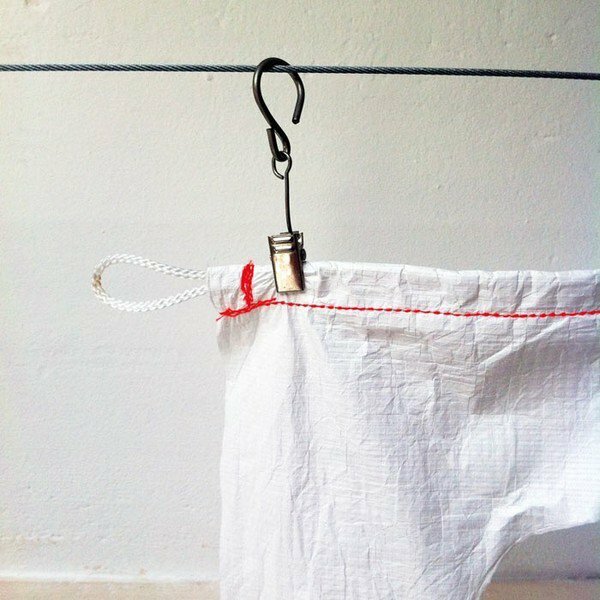 innovative - changing your habits and replacing a cotton curtain or Venetian blinds with a tyvek curtain may well change everything! graphic - there are those who are mad about bayadere stripes or Toile de Jouy, the fanatics of Louis XIV style or else huge fans of geometric, refined and sober shapes. If you belong to the third group the Tyvek Oo curtains are made for you! 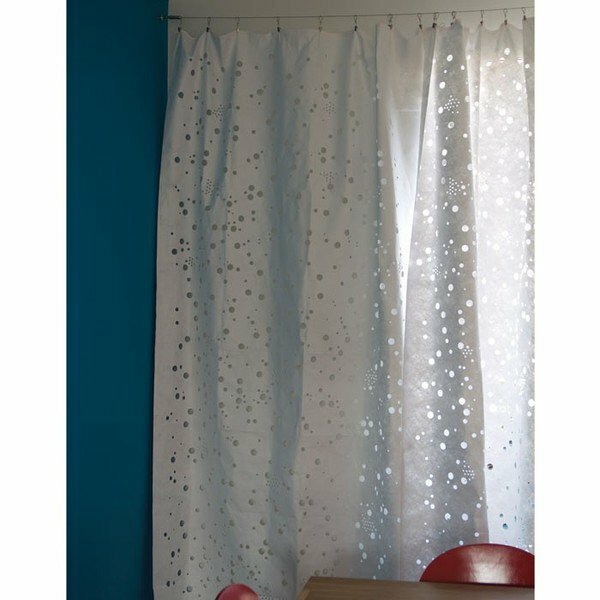 atypical - a curtain like no other.